The Crimson Purpose by Kelly L. Ward, published by Tate Publishing, is now available! It can be purchased online, or through any major bookstore! It’s also available in e-book format, as well as on Kindle! Casey Evand is at a crossroads. Deciding to leave town for college is one thing, but deciding to leave her family and boyfriend, Dan, is another story. Struggling to discern a balance between her new found resolve to follow God’s leading for her life, and a long-instilled sense of responsibility to placate her controlling boyfriend, Casey must make a choice. Although confident in her decision to let God guide her every move, Casey has not yet learned to let God guide her heart. And by ignoring His promptings, she may find erself in more danger than she can handle. Will Casey choose the path of least resistance, and let Dan dictate her future? Or will she embrace God’s call to abandon her own plans–and Dan’s will–for something better? The Crimson Purpose is a look at God’s sovereignty and faithfulness in working all things together—despite evil motives or human weakness—for the good of His children, and for the accomplishment of His glory. 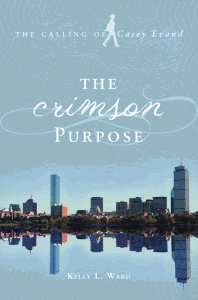 “The Crimson Purpose evokes an array of emotions…I found myself physically smiling, suppressing the lump in my throat, holding back tears, and restraining my anger…The infusion of effective biblical truth captured my heart and mind…The Crimson Purpose realistically reveals that the challenges are not larger than the solutions….” –Cindy Evans, Ed. D.
Can’t wait for your book to come out! Hope it won’t be long. Thanks for all the encouraging words! I’m excited, too! This week, I’m hoping to get my first peek at the possible cover design. I’ll keep you posted! Counting the days to get a copy. Can’t wait! So proud of you! I can’t wait to read this book! We are so proud of you! This book sounds like my story! So happy for you, Kelly. Praise God! I just finished reading your book. What wonderful book. I loved the way you developed the characters. I felt like I knew them. I love the underlying and overt Christian messages of Faith, Hope and Love. Now you left me hanging. I can’t wait to read the next one. Blessings! I will be keeping you and the rest of your family in my prayers!! You go girl!! I am so proud of you! Shari, I cried after reading your post. What a blessing! Thank you so much for the words of encouragement!! I loved it !!!!!!!! I can hardly wait for the next one to come out!! You did a fantastic job. You truly have a gift. I am so proud of you. Love you, Mom. I could not put the book down! I stayed up WAY past my bedtime to finish it. I enjoyed reading it very much. I felt like I knew the characters and can’t wait to learn more about them and their stories in the next book. The message was woven in the story beautifully. You did an excellent job!! Kelly – I worked with your mother-in-law before she retired and I requested that Greene Co. Library get one of your books as soon as she told me! Just picked it up yesterday and finished it today. It was a very quick read and I’m ready for the continuation of Casey’s story. Great first book with many more to come! Thank you for the kind words, and for requesting it for the library!! Once I hit a target number on sales, the publisher will begin working with me to prepare the second book for print! Kelly: We really enjoyed meeting you and hosting your book signing on 7/14/12 at ABC Books in Springfield MO. One oversight…you didn’t leave us any books to sell. There was such a whirlwind of activity, we neglected to arrange for that. Please contact us so that we can remedy. I stayed up WAY too late last night to read my copy of “The Crimson Purpose”. Very well written, good story, quick read. Just can’t believe you left me hanging. Hope your next book will be out soon! Thank you. We enjoyed our time with your family and friends. Please keep us posted on new released. I had a great time, too! Thank you for all you did to make it such a special event for me! I’ll stop by with some books this week!! I was at CPO, Spfd, MO and saw you book. I work at MSU and thought I would enjoy it. That was an understatement. I loved it. Can’t wait for the next one. I just didn’t find you early enough to get to the book signing. Next Time. Thank you for taking a chance and reading my book! It is such an encouragement to hear from readers! Keep in touch, and may God bless you! Hey mom cant wait for book signing tomorrow!!!!! Thank you, Hannah! I’m excited, too! Love you! Congrats at your book signing tomorrow. Thank you! I hope you and your family can come! I hear that the book is great.